“Whimsical and touching images tell the story of an unexpected friendship and the revelations it inspires in this moving, wordless picture book from two-time Caldecott Honor medalist Marla Frazee. A baby clown is separated from his family when he accidentally bounces off their circus train and lands in a lonely farmer’s vast, empty field. The farmer reluctantly rescues the little clown, and over the course of one day together, the two of them make some surprising discoveries about themselves and about life! This book unfolds like a very carefully crafted silent movie in the black and white era. The illustrations are rather dark and from a very limited palette of shades of grey and mustard. The only pops of colour are the carriages of the circus train travelling across the landscape and the jolly red of the little clown’s suit and hat. The two characters are seemingly opposite in temperament. 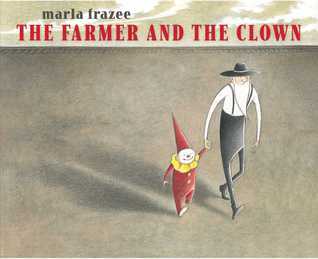 The farmer is pictured looking dour and grim and the little clown, always happy. It is only when they wash and the clown’s makeup and painted on smile is washed off that we see how sad the clown is. There is almost a complete reversal of roles as the farmer tries to cheer the clown up and entertains him in a most clown like manner. This is really lovely and I can see it being used in the classroom as a writing prompt for students. This is firmly on my ‘to buy’ list for 2015! Steph, I read this review recently.http://www.hbook.com/2015/02/using-books/home/in-defense-of-gentle-men/ I hadn’t realised how ‘controversial’ this book was – I can’t believe this perception by some readers would have stopped it being a serious contender for the Caldecott. I never thought ‘creepy old man’ when I read it. It worries me that these days we think the worst of everyone. I loved the gentle watchfulness of the elderly man and the friendship between him and the boy – very grandfatherly and innocent.